that second factor ("otherwise in the best public interest") had been added to the law recently. The County Attorney nodded agreement. 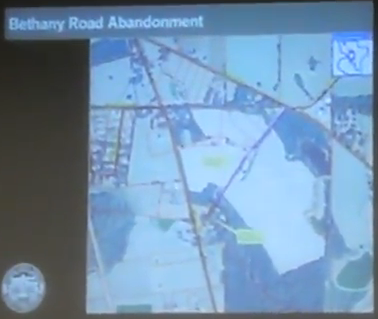 Abandonment of a Portion of Bethany Road, County Engineer, Mike Fletcher, presented the request from citizens to abandon a portion of Bethany Road. Commissioner Powell made a motion to allow staff to move forward with advertising for a public hearing regarding the matter by determining that the section of the road system has ceased to be used by the public to the extent that no public purpose is served by it and that its removal from the county road system is otherwise in the best public interest, Commissioner Evans second. Motion carried. In your agenda item there's a typographical error. It is not the annual traffic counts, it is the daily traffic counts. It is 180. So our counts was 180 per day, not annual. Commissioner Raines wanted to clarify that they weren't deciding to close the road right then. Commissioner Powell then made the motion as in the minutes. We took updated traffic counts on Bethany Road. We put two counters out. We put one counter at 41 and we put one counter at Bethany Drive. The counter at old 41 was 191. The counter at Bethany Drive was 174. So it looks like about 174 cars are using this as a cut-through to get over to Bethany Drive. He added that the only people who had contacted the county about the Bethany Road abandonment were utilities (Colquitt EMC and Georgia Power) wanting to be sure they can keep their easements. We've got three videos of that session, which includes the public hearing with people speaking for and against, and a commissioner advising those who want the road abandoned that there was no easy going back. More posts will follow about those videos. The Commissioners did vote to abandon that part of Bethany Road, but that's not the most interesting part. More later.